Justice League Vol. 8: Darkseid War Part 2 Review – AiPT! 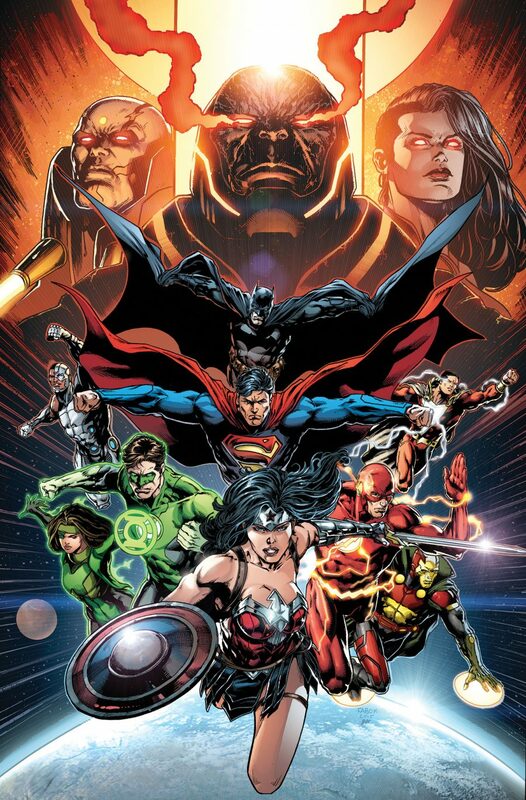 Darkseid War: Part 2, which serves as both the final installment for the Justice League series and the New 52 as a whole, is hitting shelves in a hardcover format. But is it good? There’s truly a difference between volumes that are collected as a paperback and those that are distributed as a hardcover. While both are a convenient way to read an entire story arc uninterrupted, the hardcover is the ideal format for stories that have been elevated to a character, or even universe, changing event; a hardcover is more durable and is selected for volumes that you would want to go back and read consistently. That being said, Darkseid War: Part 2 is well deserving of the hardcover bounding as it will be remembered as one of the pivotal moments in DC Comics’ history. Within the New 52 run, DC had multiple events which fell short of expectations; Forever Evil (with an emphasis on forever) and Future’s End were two of the main events that faltered to maintain readers’ interests after months of issues. However, stemming directly from the last page of Forever Evil, Darkseid War attempted to correct previous mistakes by packing an absurd amount of writing and artistic talent into the creative team. While the first arc of the story was able to capture our curiosity, our attention was now dedicated solely to this last act and Part 2 delivered. This arc begins with aftermath of Darkseid’s death just as the Justice League inherits the powers of the Gods. Despite so many subplots, the storyline is fairly streamlined and accessible to readers. Granted, this book would by nigh impossible to follow without having read Part 1, but it resists the urge to overcomplicate the climax of the story in an attempt to make it more exciting. In fact, this is one of, if not the most action-packed arc of the New 52 Justice League run. While Forever Evil had its recap issues with slower paced character reflection, Darkseid War refuses to even take a breath and that’s only reinforced by Manapul’s and Fabok’s artistic style and sequencing. Despite featuring a high percentage of action, Geoff Johns is capable of writing a story that not only serves our immature desire for epic battles and explosions, but one that also paints our “super” heroes in a very human light. Despite being the same arc where our heroes become literal Gods, the JL reaches some of their lowest points. Between Mobious and Darkseid, Grail and Diana, and the rest of the League against themselves, Darkseid War is all about the role of power and its presence in war, whether it’s physical or internal. This theme is executed effortlessly by Johns and just goes to show why he continues to climb the ladder at DC Comics. Never have I ever seen so many well-articulated splashes and spreads over the course of a single volume. The one-two punch of Manapul and Fabok is hard to compete with, making the aesthetic of Darkseid War: Part 2 easily the best thing about this book. While the penciling is at its best, the issues are also chock full of eye popping color. By simply flipping through the pages you can tell each panel is saturated with detail and dark, rich colors. Darkseid War: Part 2 is an essential component of any comic book fan’s collection as it seamlessly blends the end of the New 52 with the platform for Rebirth. DC pulled out the big guns for assembling a worthy creative team and it’s apparent on every page.